I always enjoy the process of starting a new money making idea or side hustle. The process is simply wonderful with any side hustle. There’s the daydreaming phase, researching the topic, devising a plan, and ultimately a foray into the unknown…somehow this process always seems like a lot more fun than work or school! Recently, I’ve been feeling the itch to start another side hustle. I’ve contemplated starting up my dropshipping business again, launching an Amazon Affiliate store, or taking on some other venture. However, with recently starting my job, making money with freelancing, and the beginning of a new semester (I have 1 stupid course left), I’m afraid I’ll have to postpone any new side hustle endeavor for the time being. That being said, I believe that my side hustle content is some of my very best, and I don’t want to postpone sharing some money making ideas with all of you for several months! And so, I want to share the experience I had earlier this year with opening up an Etsy shop and successfully selling (and then refunding) 2 POD items. A quick breakdown of my Etsy store and sales. How to setup an Etsy shop – setup process and pricing! How to link Printify (a POD platform) to Etsy. 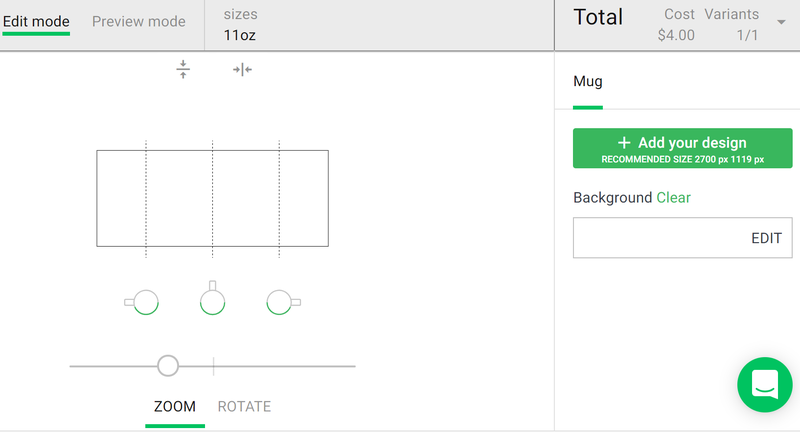 How to quickly design POD products on Printify. My experience with marketing my Etsy shop. Selling POD items on Etsy – Etsy versus Shopify. The pros and cons of selling POD items. If you’ve ever thought about making money on Etsy or opening your own Etsy shop, this is the post for you! Appealing to impulse purchase behavior will always be a strategy for sellers in brick and mortar locations and eCommerce platforms alike. We see examples of this everywhere. Grocery stores place candy bars and other alluring snacks by the checkout isle, and eCommerce stores are masterminds at pushing last minute deals your way as you progress through a sales funnel. When I opened my own Etsy shop earlier this year, I decided to apply the concept of impulse buying behavior and kept things simple. I wanted to design and sell cheap merchandise that was funny, eye-catching, and didn’t require hours of painstaking graphic design work or artistic talent (of which I have none). 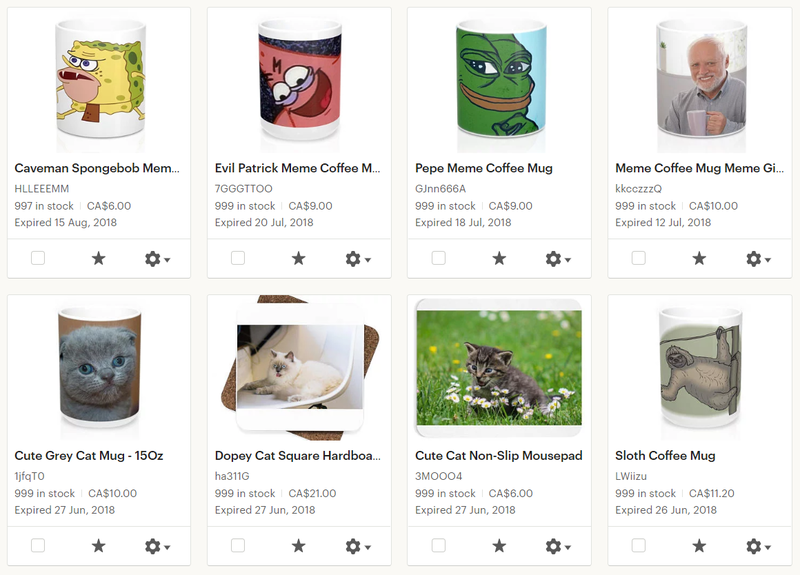 Ultimately, I opened a shop called Easily Amused Designs – a shop that specialized in plastering stupid images on mugs or other common gift items and selling them for low margins. I still don’t know why my logo is this Eggplant, but I liked him. If you think this post is a joke and are wondering who in their right mind would buy this stuff, you’re not alone. All of these items required about 5 minutes of work to create, and they certainly look the product of a low effort endeavor. Now, unbeknownst to me at the time, you can’t actually use POD websites to sell copyrighted material. While I’m disappointed in the high moral standards of POD websites, it was my fault for not reading the terms and services of Printify and for putting 0 work into my design process. However, my experience with starting an Etsy shop does prove you can make money by selling gag items or low-effort merchandise on Etsy. Yes, 478 people have purchased a creepy Nicholas Cage notebook. I’m not advocating for intellectual property infringement or suggesting you rip off some artwork and plaster it on your own merchandise, but this entire process has proved that the barrier to entry for starting your own Etsy shop is low in terms of skill and effort. So, if you lack artistic capability like me, opening an Etsy shop could be something to consider. Just find some memes, funny copyright free pictures, or design your own minimalist artwork and get going! One of Etsy’s main strengths is the low barrier to entry and ease of setting up your own shop. Etsy is a marketplace, not a eCommerce website hosting solution/website builder like Shopify or WooCommerce. There is a difference! When you open your own Etsy shop, it’s basically the virtual equivalent of opening up a stall in a marketplace or bazaar. You still have to design your shop and list items, but when you sell on Etsy, you are ultimately just a shop in a marketplace. This will come with some inherent advantages and disadvantages. Now, Etsy has recently released Etsy Pattern, which allows for Etsy shop owners to build their own stand alone website, but this isn’t what I used to open my own Etsy shop. I’ll get to the whole ‘Etsy versus Shopify’ conundrum later on in the article, so don’t fret! Anyway, starting your own Etsy shop doesn’t take much time. Stocking your shop with at least 1 item. Determining how you will be paid. Etsy will then prompt you to provide an email address for registration, so be sure to use the email you want to associate with your Etsy shop. Once you register, you can start the process of opening your shop. This should take less than a minute. Just be sure to select the right shop language and currency to start off correctly. I also suggest going with a Etsy shop name that is either brandable or directly explains what sort of merchandise you sell. Unfortunately, you cannot connect Printify or other POD services to Etsy before your shop is actually setup, but you must add at least 1 item to your shop to complete the setup process. This wasn’t the case when I started selling on Etsy, but I figure they have put this in place to slightly increase the barrier to entry in terms of effort. In any case, just make up an item, grab some picture off of Google, and add a fake item to your shop to complete registration. Delete the item after you are done. Etsy does charge a $0.20 USD fee every time you list an item, so you’ll have to sacrifice $0.20 with this strategy. However, if you do have your own merchandise you plan on selling or if you are white labeling your own Etsy products, I suggest adding a real item to your shop during the setup process. Adding photos from multiple angles is generally a good practice as an Etsy seller. Now, the listing details for items in your Etsy shop are immensely important for driving traffic to your products because Etsy is a very competitive marketplace. It might not be Amazon keyword stuffing level, but it’s still a marketplace. Any advantage you can gain is critical. So, take some time to research other successful products in your niche and see what the best sellers in the niche are doing. Name your products with search friendly titles that grab the attention of shoppers while still using the main search phrase you want your item to rank for. Additionally, take advantage of the description space you are provided with. 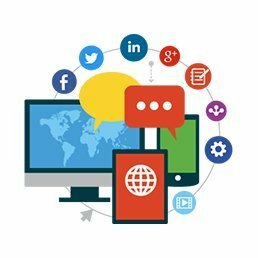 Pepper in the keywords and search phrases you want to fight for, describe the benefits of your products, situations where a buyer might want to purchase your merchandise (i.e. ‘this is a great gift for X’) and other relevant bits of info. If you are going to use a POD service, you must also specify this in the ‘About this listing’ section! To do this, simply state that another company or person will manufacture the particular item in your shop. Tags are optional, but I suggest including as many relevant tags for your item as possible to help your results when buyers search for items. You should also include relevant information regarding the materials your item is made of. Finally, I suggest you remain extremely competitive with your pricing. I aimed to sell most of my merchandise for under $10 USD because this seems like a low enough amount to prompt impulse shopping. My pricing also included shipping on the buyer side of the equation, assuming they lived in the United States. Ultimately, this meant I was only going to make between $2-$3 for every single product I sold since Printify would also charge me a few bucks for the creation of each item. However, most of my sales would still result in a 20-30% profit margin, and selling on Etsy is about figuring out what works and then scaling. Hell, if those Spongebob mugs had been able to sell, I probably would have turned my shop into a Spongebob emporium. Besides, once you figure out what people like to purchase from your shop, you can take the same design and apply it to higher-end items that will generate more revenue per sale. The next steps just require you to select your payout method and associate a credit card or billing option for your shop. Listing items: Adding items to your Etsy shop costs $0.20 USD, and items are listed for 4 months before expiring. Expired items can be manually or automatically renewed for another $0.20 USD. Transaction fees: Etsy charges a 5% transaction fee for your item price plus shipping. There are other fees associated with Etsy Plus or Etsy Pattern, but I will get to those later! Congrats, you are now setup as a seller on Etsy! I recommend taking some time to familiarize yourself with the shop layout, edit your shop information, describe your return policy, and write a flushed out ‘About’ section. The more genuine your shop looks, the better! Now, let’s look at connection a POD service to your Etsy shop! Once your Etsy shop is setup, you are ready to connect a POD service that will handle the manufacturing and fulfillment of goods. Personally, I recommend using Printify as this is the POD service I use and recommend. To get started with Printify, you’ll need to create an account and provide an email address. I suggest using the same email used for your Etsy shop. If you prefer to watch a video that covers how to connect your Printify account to Etsy, Printify has actually made a great 4 minute video that walks users through the process. If you have connected POD services to other eCommerce platforms before, you can probably figure it out yourself. Make sure your Etsy shop is setup. 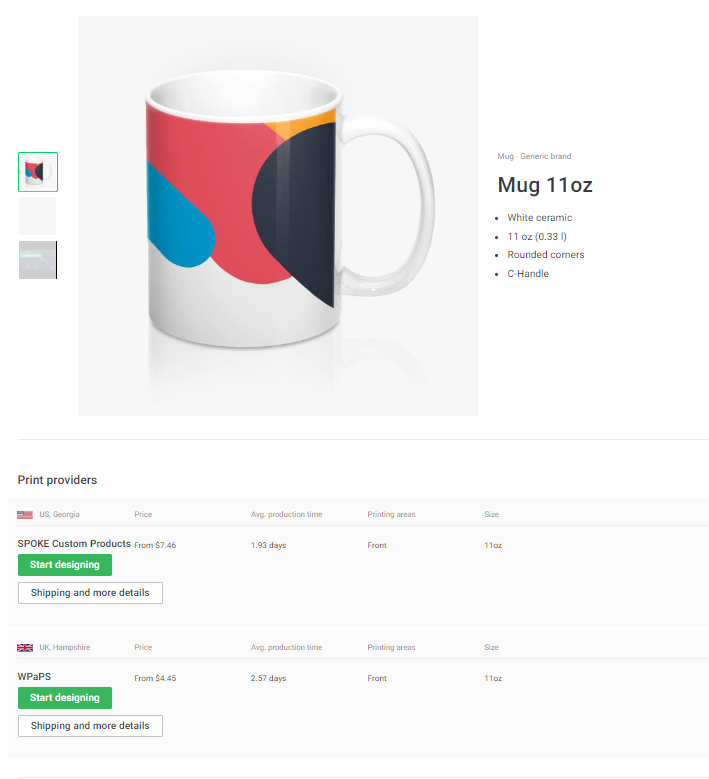 Create an account on Printify. Allow Etsy to access your Printify account when prompted. That is the entire process. You are now ready to create products on Printify! One of my favorite aspects about Printify is their product catalog. In any dropshipping business, customer returns or complaints are your worst nightmare because you are the only person who loses in the event of a return. I mean, what would be worse than paying a manufacturer, having them ship a poorly made product, and then losing all your money after a disgruntled customer returns their order. Not fun. Thankfully, Printify has a decent product catalog with a healthy variety of product options to spice up your Etsy shop. Additionally, most of their manufacturing partners are located in the United States or the United Kingdom, which can dramatically reduce shipping time and increase the quality of your goods compared to Chinese manufacturers. In terms of choosing what items to design, I decided to stay away from the apparel niche. People are picky about the quality and fit of their clothing, and I wanted to sell impulse gag gifts that had a lower probability of being returned than a shirt that didn’t fit quite right. As you can see, these production partners differ in terms of their pricing, but manufacturing time isn’t significantly worse for the cheaper option. I’m going to pick WPaPS in the United Kingdom and start designing! If you haven’t created a design for your merchandise, you’ll need to do this now using whatever photo editing software you are comfortable with. If you have your graphic already, upload it via the ‘Add your design’ button. Aim to upload a high resolution file. On the edit product details screen, you can verify that your product looks the way you envisioned. This section is where I suggest peppering in keywords that will slowly help your Etsy product rank strongly in their marketplace. Additionally, you should really consider all of the Etsy fees, shipping, and how much you will have to pay Printify to hanle manufacturing fulfillment when setting your price. Just remember: publishing an item to your Etsy shop will automatically charge you $0.20. I suggest making your item invisible upon publishing to publish a hidden product to Etsy (that you can edit to perfection before paying the $0.20 to have it listed). 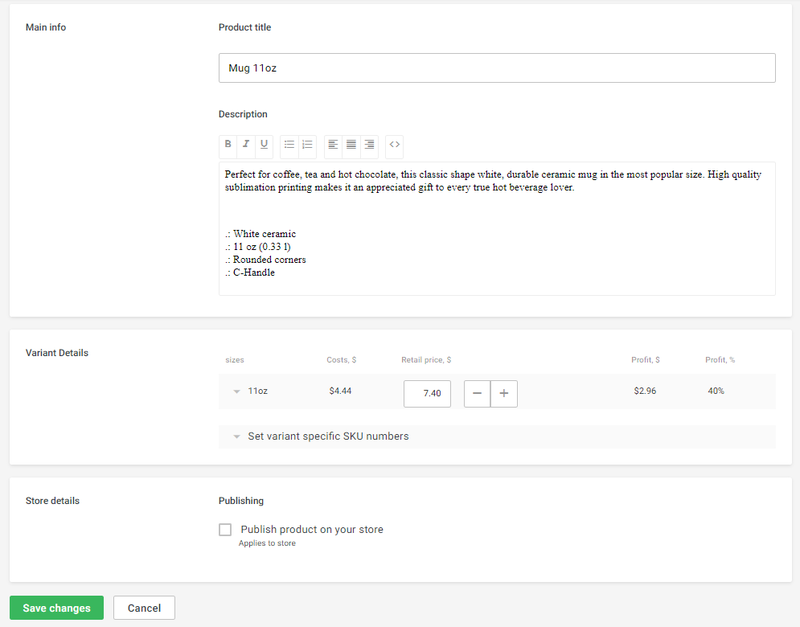 Additionally, you should conduct the final product detail editing in Etsy, since product description and other information can appear differently in their user interface compared to Printify. I suggest creating a few items to give your shop some variety, but don’t go crazy. The name of the game is impulse shopping, and you shouldn’t bite off more than you can chew at the start of opening your Etsy shop. Once your shop is ready, you are ready to market! While you can pay for advertising on Etsy and push your products to the front page of specific search terms, I never experimented with this system because I was unsure if my POD shop would even work. So, how did I generate 2 sales? Honestly, I just relied on bits of organic traffic from Etsy and an Instagram account I made to promote the shop. My Etsy shop only received about 100 visits in the time it was open, so 2 sales is a 2% conversion rate (I’ll take it). To generate traffic for my my shop, I wrote keyword rich product descriptions and product titles. 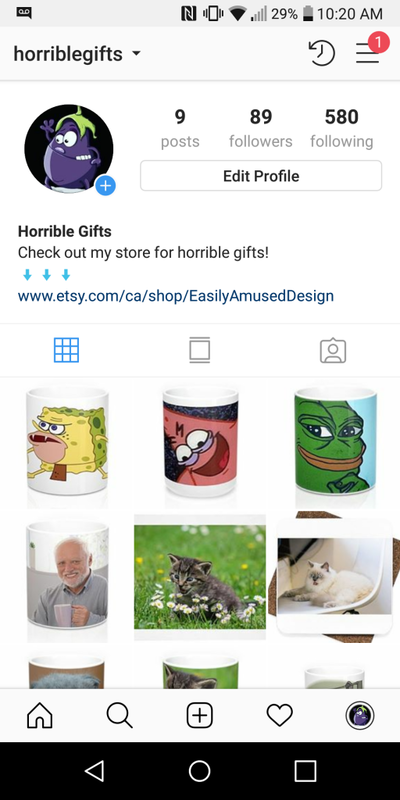 I also created an Instagram account called Horrible Gifts to promote my shop. At it’s peak, the Instagram account had roughly 150 followers, and my posts all included a variety of trending hashtags to generate as many impressions as possible. 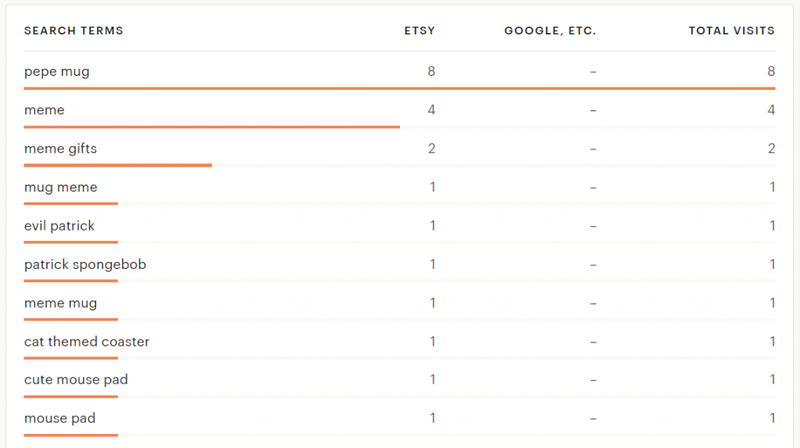 These metrics are incredibly valuable for Etsy shop owners because it can highlight commonalities in keywords that result in shop traffic. For example, my shop was clearly benefiting from search terms containing the phrase ‘meme,’ and if my shop had continued to operate, I would have optimized my listings to take advantage of this. Ultimately my shop didn’t really take off, but I think this experiment has still shown that you can start your own Etsy shop and slowly generate sales and grow. 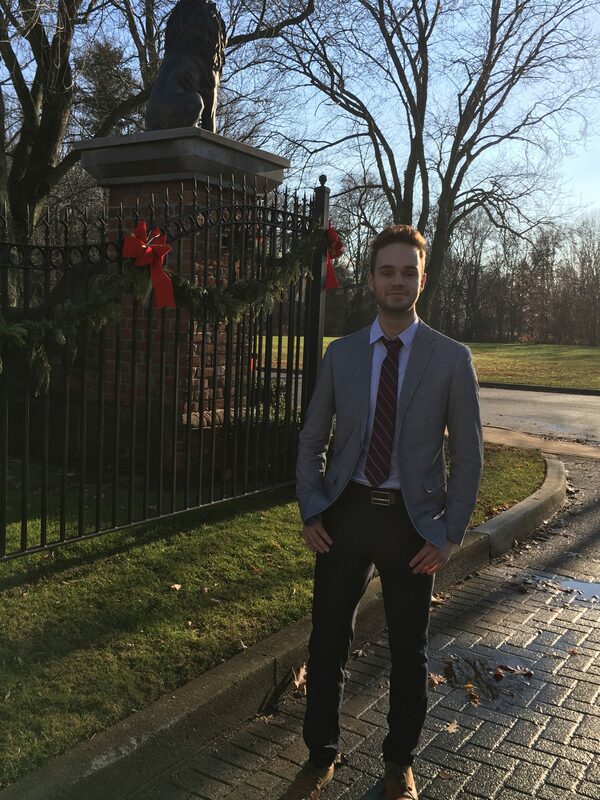 I have run my own Shopify store before when I started dropshipping, and I certainly have a soft spot for the platform. However, I believe that when selling POD items, you are better off selling on Etsy than creating your own Shopify store. Etsy is a marketplace that is all about handmade items, crafts, art, or vintage products, and the nature of the marketplace platform allows buyers to use Etsy as a search engine to search for what they want. On Shopify, you can sell anything…but your store will not reap the benefits of being listed on an active marketplace. There is a great guide that compares Shopify to Etsy by nchannel, and I suggest giving that a read if you want to learn more about the differences between platforms. However, in a nutshell, Etsy will always be the cheaper platform unless your shop really takes off and generates more than $1,000 in revenue (since the 5% transaction fee will eventually cost more than you save by avoiding Shopify’s monthly plans). As I mentioned earlier, Etsy has come out with Etsy Pattern, which allows Etsy shop owners to create a standalone shop for the cost of $15/month. 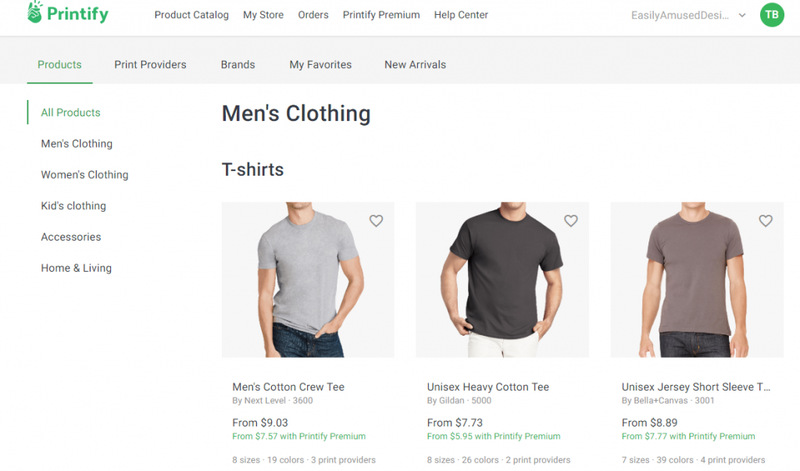 However, Etsy Pattern shops are not connected to regular Etsy shops or even searchable from the Etsy marketplace, and the functionality of the platform doesn’t come close to Shopify or WordPress websites. So, I suggest starting out slowly and opening your own Etsy shop to keep costs low. As your store expands, you can always reinvest your earnings into Etsy advertising, expand your shop to another platform, or sell on both Etsy and Shopify simultaneously! I’ve touched on the benefits and drawbacks of using POD websites to sell artwork before in my interview with artist Grant Carter, and my opinion hasn’t changed too much since then. Starting a dropshipping business and dabbling in selling POD products on Etsy have taught me just how competitive these industries are. Profit margins with POD businesses will be tight, and a lot of niches have low-cost products to begin with, so you’ll need regular sales volume to really make some money. However, starting a POD business is also one of the easiest ways to get started with making money online. By selling items on Etsy, you can maintain a low amount of risk while learning valuable skills in the world of eCommerce. This seems like a win-win scenario to me! 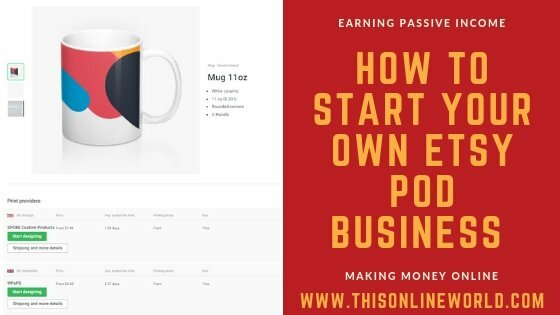 Granted, opening your own Etsy shop probably won’t make you rich…but if you can grow a shop to sell a few products every single month you can easily develop a modest passive income stream that will grow. If anyone is experiencing an itch to start making money online or run their own business, I recommend that you turn to Etsy for your first steps. Who knows, maybe one day thousands of people will be buying your Nicholas Cage themed merchandise! Sounds like we’re in a similar boat! I’m working full time and taking 4 college classes as well as running an eBay business and an antique booth on the side. And blogging every week too lol. It’s always fun to start a side income project. I’m hoping to eventually match my salary with eBay profits. Thanks for sharing this info! 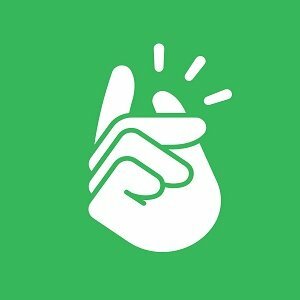 Has anyone tried Printful instead? They seem to be larger.